We’ve developed a proprietary coating for oxygen sensing in biological environments that has zero drift from photo-bleaching in long-term exposure. The AP Series of zero-drift oxygen sensors come in different probe and patch form factors. Our high-performance zero-drift acrylic oxygen sensor patches (AP series) are designed for non-invas.. Replacement oxygen sensor cap (zero-drift, AP series) for DOPO2. This cap is attached to DOPO2 EOM a..
High performance, flexible semi-disposable oxygen sensor fiber optic plastic probe. This probe (z..
Our new needle oxygen probes are an industry first. 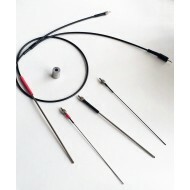 These unique oxygen probes are ideal for measur..
--- Please Select --- 1/16"	1/8"	5/32"	1/4 "	12/32"
Our zero drift oxygen sensor stainless steel fiber optic probes are designed for monitoring of oxyg..
Our high-performance Zero-drift oxygen sensor stainless steel probes with an embedded thermistor are..